Eastern Cape is one of South Africa's largest provinces with Bisho as capital city, and East London as well as Port Elizabeth being two of the province's largest cities. The region has an estimate population of over 6 million people. The iconic Nelson Mandela Bay is situated in Pretoria and is one of the busiest working hubs in the Province and one of the most iconic tourist destinations. Pretoria is the Central Business District for government and commerce, whilst attracting many tourists each year to visit the beautiful city and its surrounds. It is not only known as the "The Friendly City" but is also home to the Big 7 (rhino, leopard, buffalo, lion, elephant, humpback whale and the great white shark). Locals and visitors can enjoy ample and amazing things to do, from the Broadwalk Casino and fantastic nightlife, to various tours, game safaris, Blue Flag Beaches, water sports activities, grand shopping malls and so much more. 33 new job listings for this search have been found in the last calendar day, compared with 66 in the last 72 hours and 206 in the last week. There are 1,641 current live jobs in Nelson Mandela Bay available immediately, compared to 1,556 in Port Elizabeth. 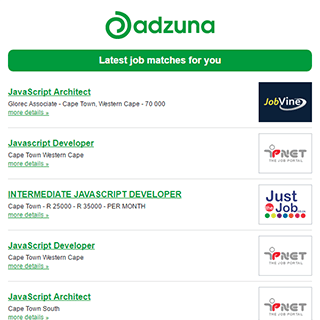 Companies presently offering current live jobs in Nelson Mandela Bay include Private Property, King James, Pioneer Foods..
Get the latest Jobs in Nelson Mandela Bay delivered straight to your inbox!